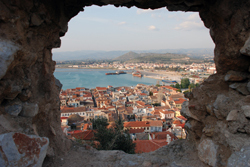 Argos is the oldest inhabited city in Europe. 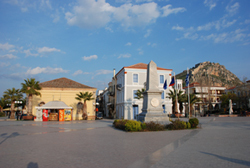 The archaeological finding shows that the city of Argos is inhabited since Neolithic times. It is the largest and most populous city of Argolis. 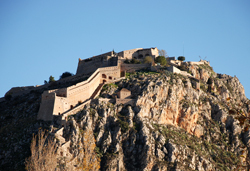 It lies about 10 km from Nafplion and 135 from Athens. It constitutes a commercial and financial centre of the county, having energetic presentation with great moments at the late history. 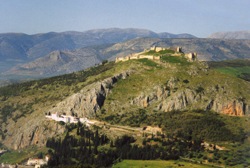 In the centre of a tough and dreamy as well landscape in the southern Argolic Gulf, dominates the legendary Acropolis of Mycenae. Here Zeus while disguising as a golden rain joined the granddaughter of Danaos, Danae. 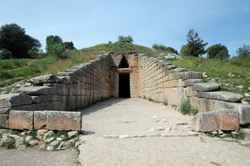 From their union was born the founder of Mycenae, Perseus. Based on the poems of Homer, Henry Schliemann in 1850 will do some excavations and he will proof that behind the myths is hiding a brilliant culture. The visitor today can admire the Lion Gate with Cyclopean walls and he can see Grave Circle A in the Grand Palace and numerous houses of the era. Beyond is the Gave Circle B with 24 tombs of whom the 14 are royal. 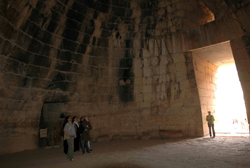 The most impressive is the famous vaulted tomb of Atreus. The visitor feel awe for these famous buildings, the impressive findings, the beauty of the city and the aura that still exists from that great culture that marked the history of ancient Greece. Wherever you approach the area of Epidaure, you can only admire the natural beauty that captured in this place both gods and humans. 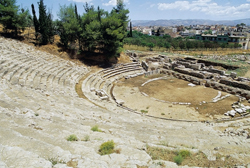 The ancient theatre is a part of a larger archaeological site of Asclepius Sanctuary. The Asclepius Sanctuary of Epidaure is composed of several buildings, all devoted to the cult of Asclepius and it was a religious and cultural centre of the most important city-states of Ancient Greece. 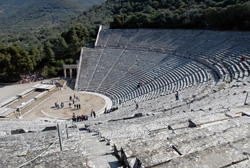 The excavations, which began around 1880 revealed what is now the most comprehensive global sample of ancient Greek theatre. 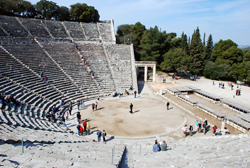 The ancient theatre of Epidaure attracts many tourists especially in August where theatrical performances are taking place. 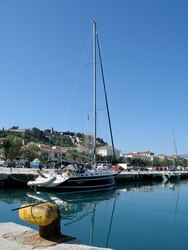 The uniqueness of Spetses lies in combining cosmopolitan atmosphere with diverse natural environment and rich tradition. The quaint carts are the main means of transportation to all parts of the city, since cars are prohibited. 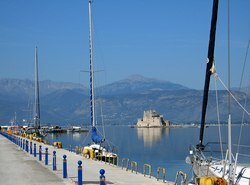 You will arrive on the island with the ferry from Piraeus or from the port of Costa at Argolis. 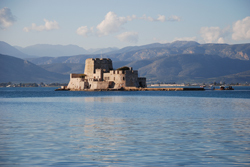 One the island, visitor ’s interest is attracting by Bouboulinas house which is operating as a private museum with personal belongings of the heroine, the house of Chatzigianni Mexi now operating as a museum, the Korgialenios School and the mansion of the great benefactor Anargyrou. 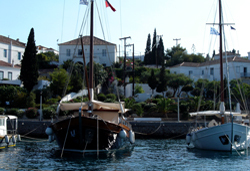 The unique beaches, the beautiful pine forest, the stately small maritime city are some of the reasons we suggest you going to Spetses. A rich and beautiful island. 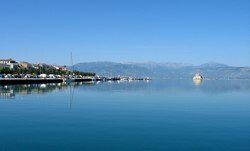 In the centre of the island is the town situated amphitheatrically around the port. 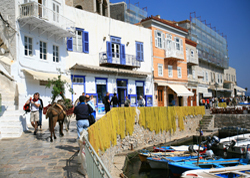 The main characteristic of Hydra is the donkeys anytime available for the movements of a wheeled prohibited, which makes the island most picturesque. 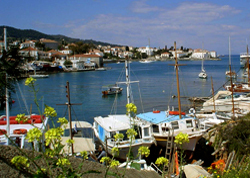 On the island you will enjoy romantic walks at the picturesque cobbled narrow streets. 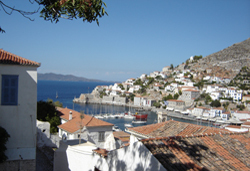 Hydra is known for its quiet life offered during the day and lively cosmopolitan night life. Its name comes from the rich sources and the water that comes from antiquity. The beautiful beaches along the grey of the rocks and the blue sea give the island a wild beauty. In late June at the island is taking place a big performance with representation of the Turkish flagship blasting by Miaoulis. 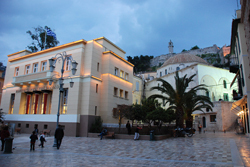 It is no coincidence that Hydra has too many fanatic visitors all around the world. Poros is one of the most beautiful islands of the Saronic Gulf with picturesque houses, beautiful beaches and hills full of pines. In the city are scattered traditional cafes and taverns serving traditional dishes and delicacies. At the highest point of the town dominates the bell tower with amazing view from there. 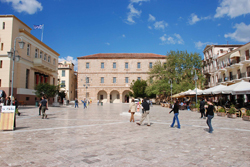 By taxi you can reach the 6th century’s BC temple of Poseidon and the monastery of Life Giving Fountain. 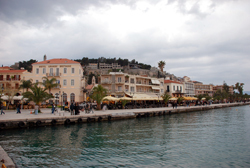 You can reach at Poros by ferry from Piraeus or from the port of Galata at Argolis.